Brooks' marketing pitch: A minimalist silhouette but with cushioning where it counts. Outsole: Circular carbon rubber pods. Want a lightweight pacer minus the bone jarring midsole flatness? The Pureconnect 4 will do the honors. 2015 ushers in four years of the Pure series. It’s good to see the Pure series still going strong in its fourth year, considering their initial release intended to tap into the then booming minimalist shoe market. Now that brief era of all-out minimalism is just a footnote in running shoe history, with the trend of thin midsoled, low drop shoes being replaced by that of ‘maximalist’ models. Talk about something rapidly metamorphosing into its polar opposite. This is what the first (2012) Pureconnect looked like. We had a go in the original Pureconnect back in the day, and fortunately, we still had a pair around. So the process of comparing it with the 2015 edition was interesting, to say the least. Is the new PC-4 still close to the foundational model? Or has it strayed vastly from its original brief? A few runs later, we found our questions answered. It would have been more helpful if we had all four Connect versions on hand, but the original PC is the only past experience we have on our wear-test resume. Close to the original’s fundamentals, except that the ride’s more cushioned and upper plushed up. A majority of design elements stay true to what the Pureconnect was once, with some adjustments blended in to keep up with the changing times. If we were to call out two most important areas of change, that would be the midsole ride and upper fit. 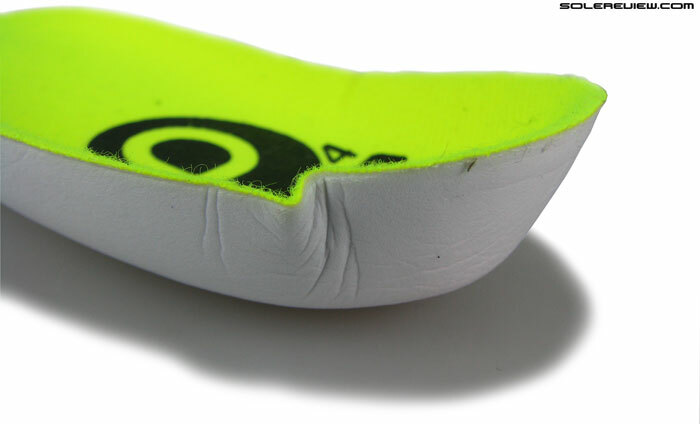 The 2011 Pureconnect had a firm, low to the ground racing flatfish feet mated to a minimal upper. The 2015 version is a couple of steps removed from that template. Present day running footwear market is being snow-stormed with midsole softness, and the new Pureconnect catches some of that too. It rides softer and responsive than three years prior, and even its upper gets infused with extra plumpness. None of the either updates are bad, because there’s no overdoing here. The 2015 PC4 plays to the underlying strengths of the original Pureconnect’s character, yet stays relevant to contemporary trends. As you know, the Pureconnect together with Pureflow and Cadence form the Brooks Pure series. We haven’t got around to doing miles in the Pureflow 4 yet, but based on its online product description and our initial on-road experience of Cadence 4, we have a fairly good overview of how the three models are meant to be differentiated. Going by what Brooks says, Pureflow is supposed to be the most cushioned of the lot, with the needle moving towards increased firmness and support as we go from Connect to Cadence. That said, the lines are blurred, and the assortment lacks clear, linear separation. For example, we found the PureCadence to run firmer than Connect 4 and with a wider midsole base, yet the PureConnect’s upper has better arch support. And we’re willing to bet that when we review the Pureflow 4, there are bound to be performance based overlaps as far as cushioning and support is concerned. This makes the process of deciding which Pure shoe to buy a not so easy one. We think the right way to solve this quandary is to treat all three shoes as the same model, but with different levels of calibration. Naturally, the ideal starting point would be to try all three shoes on first, and then try to find your way home from there. As reviewers, the best we can do is to get down to brass tacks, and lay bare the shoe’s characteristics. Toebumper is internal. Can’t see it, but it’s there, alright. Molded Brooks logo is also reflective. Shine in night strips on the heel – one on each side. 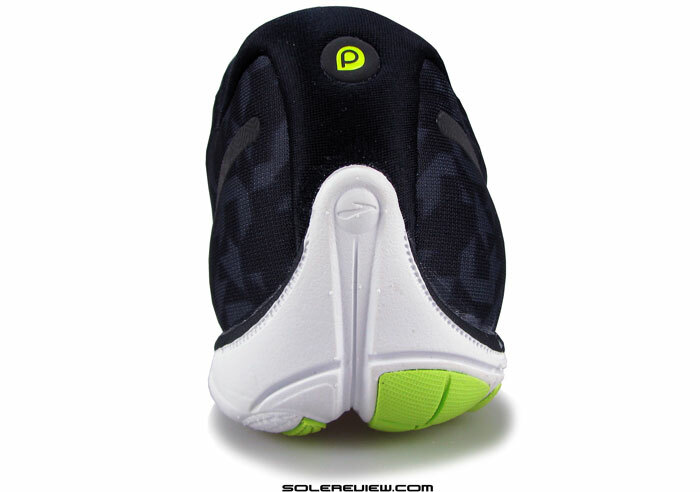 The Pureconnect 4 has a soft fabric upper which is nearly overlay free. Except for the midfoot window which houses the ‘Nav-band’ and logo treatments, the upper mesh surface is uncluttered with layers. The toe bumper is part of the upper interior, an unseen component which gives shape and structure to the toe area. The logo and strips bounce back light in darkness. Not very luminous, but they do their job. 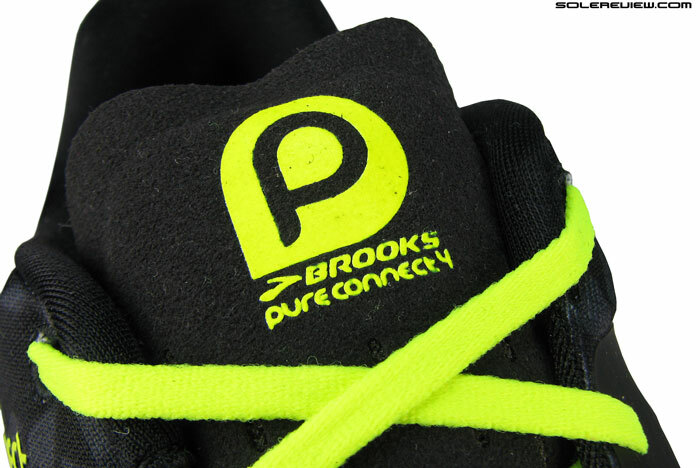 Brooks logo is made of molded TPU, which doubles up as a reflective element too. 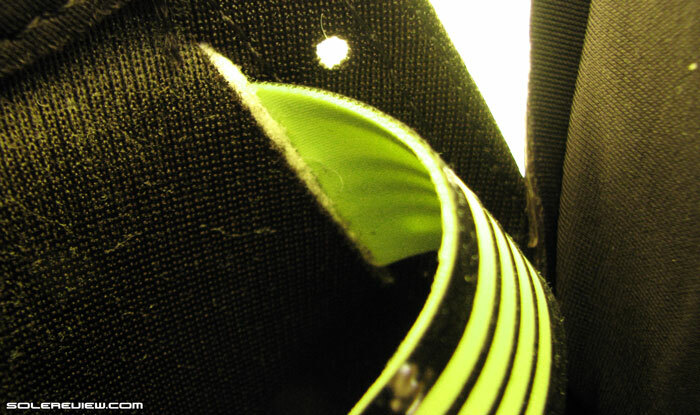 A pair of curved strips flank the side of the heel, and these offer the sum total of Pure-connect’s night-time visibility. Reflectivity is somewhat dulled by the use of non-metallic colors, so the shine-back comes through as muted when compared to metallic silver colored pieces. This is the ‘Nav band’ – an elastic strap which wraps around midfoot. This is a standard feature on all Pure series shoes. The material is stretch fabric with heat fused urethane for reinforcement. 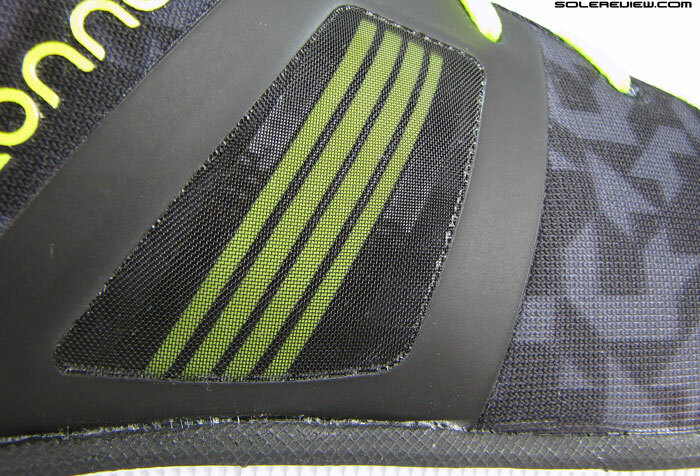 Upper mesh has a lining inside, save for a small spot in the forefoot. 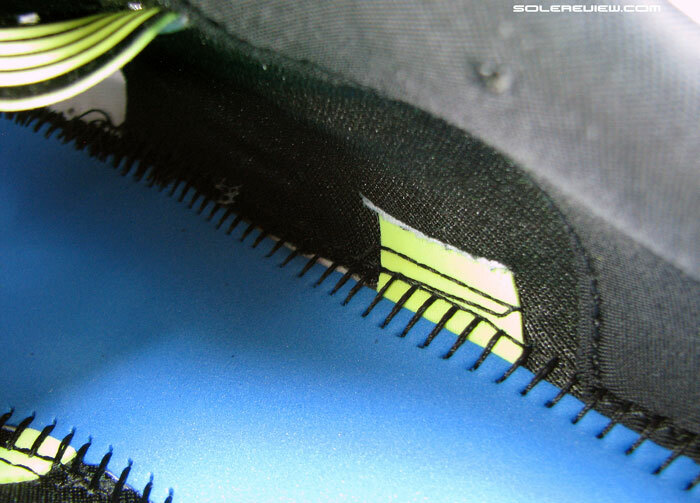 Inner lining serves an important purpose in the PC4 – that to insulate the foot from the elastic ‘Nav-band’ which wraps around midsection. 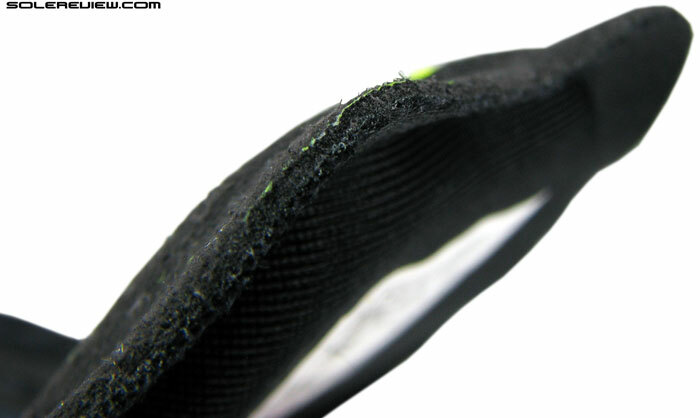 The stretch band is narrower in width on lateral side than it is on the medial (arch) side. Medially, the strap gradually widens up downwards and then splits into three separate bands. One goes outside the upper and over the midsole, and the remaining two flank the sides and stay inside the upper. The open air mesh window lets you see the Nav band, and also adds color contrast. The stretch band is a feature which debuted on the original Pureconnect, and has been a fixture ever since. It is not without its share of evolutionary changes; medial width of the nav-band (at its widest point) is more than twice of what it used to be in 2011. If it interests you, the Connect’s Nav band is widest (medially) relative to Pureflow and Cadence, thus targeting to deliver higher level of upper arch support. Synthetic suede tongue with fused edges. The corners are sealed without stitching, but there’s no poke. Tongue’s made of a soft synthetic suede on top and softer mesh lining inside, with plenty of foam padding in between. And for reasons only known to Brooks, the Connect 4 uses a softer suede material than Cadence. 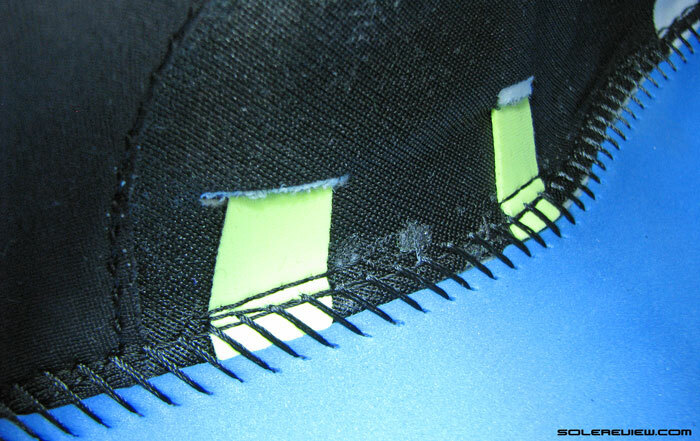 Given the fact that the tongue edges are fused and not stitched, a softer layer helps. Cadence 4 has a similar design, but by using a harder suede type, the edges poke into the feet. More on that during our review later in February. Tongue has ample padding, and is wide across – helps control tongue slide. Doesn’t eliminate movement, but minimizes it to a certain extent. Tongue is one of the areas which has gone plusher from what used to be once – and we’re talking about PureConnect OG’s relatively spartan set-up. That said, the PC4 misses the elastic mini-gussets (of Connect OG) on either sides which kept the tongue in firmly in place. As a compensatory measure, the tongue is much wider (a la Mizuno) which attempts to minimize slide. Not completely effective though; there is a small amount of slide, but nothing which we would call a bother. 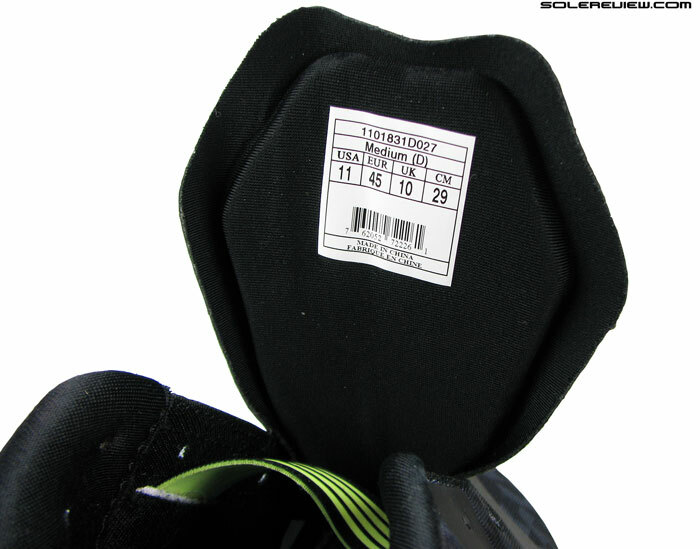 Heel collar has a neoprene kind of mesh lining, and is plumply padded. Internal heel counter, but no overlays. The heel area will feel a familiar place if you’ve been a Pure series regular. 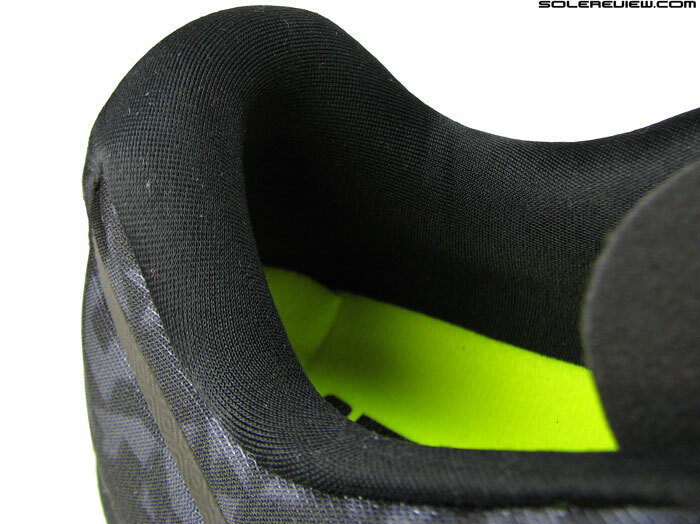 The lining is a neoprene kind of mesh which has been used in Pure shoes since inception, and it’s well filled with foam, especially around the Achilles area. This nature of construction makes the Achilles dip soft to the touch, which is always welcome. We’d like to call out that the heel section isn’t collapsible because an internal counter sits molded within. This isn’t a new addition, it was there in the original Connect too. Heel collar feels nice to slip in to. The smooth textile is friction free, and soft Achilles dip has a minor amount of stretch, making it easier for your foot to slide in and out. Not much of a forefoot flare, with a narrow midsole base. Talk about upper fit, and the word snug will be commonly used to describe it. 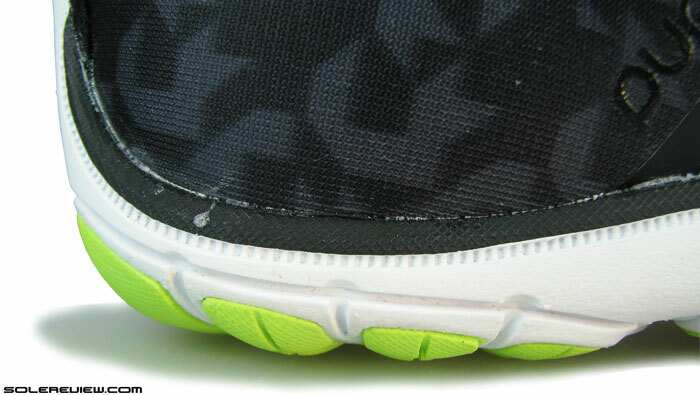 There isn’t much forefoot room on either side, and neither does the midsole flare out, making the base narrow. Just because the upper material is soft and without overlays, it allows some wiggle/splay room. Right in the front, the toe box runs small and shallow. Some will feel the need to buy half a size larger. Noteworthy of mention is the fit difference between different Pure models. Can’t comment on the PureFlow yet, but the Cadence runs half a size bigger than the Connect, with a thumb’s width of sizing difference. It must be pointed out that none of the Pure shoes come in additional widths, so the default fit is all what you get. The Pureconnect’s ‘Nav band’. Supportive, maybe too much so. Midfoot is snug, perhaps more than what it needs to be – with particular focus on arch side. The Nav band performs as advertised, and yet you can’t seem to shrug off the feeling that there’s too much of it. During runs, one feels the forward section of the Nav Band pressing into your arch, and we’re not overtly fond of shoes which do that. And the contrast was even more stark in face of how the original Connect and Cadence 4 felt, meaning neither of them had this overbearing feel of wrap. 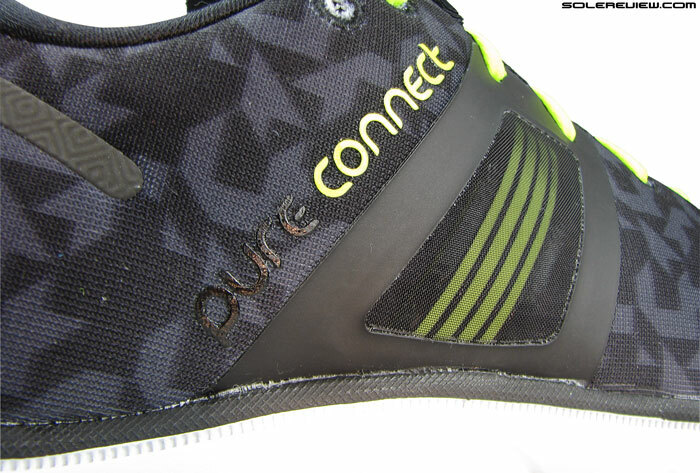 The Pure Connect’s midsole has a fairly slim waist in the midfoot, which leaves most of the arch hugging duties to the Nav band with a 1-into-3 split design. The Nav band splits into three straps on medial side. Two flank the center band and slide inside the upper. Lateral band design is pretty straightforward, just one strap coming in. 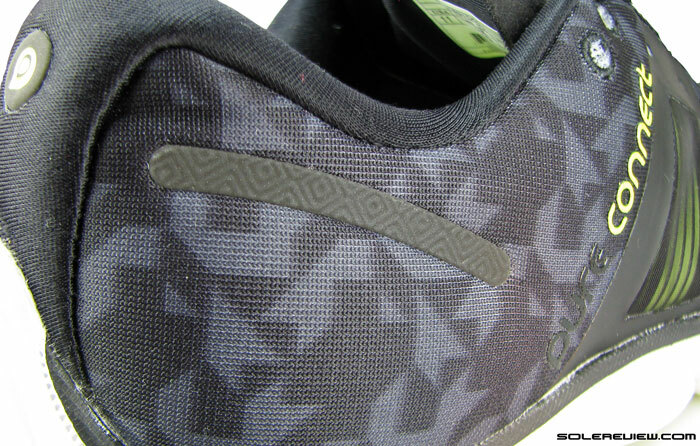 You can see the split design of the Nav band inside the shoe once you remove the insole. Put the prominently curved footbed back in, and it hides the exposed Nav band straps connecting to upper base. PC4 insole’s arch curve is quite a spectacle. The noticeably contoured insole has a raised arch profile and combined together with Nav band, it does provide good upper arch support, but then there’s that question of whether it is too much of a good thing. 5+1 rows of eyelets, and wide spread lacing. That translates into more top down pressure. We haven’t tested the PureConnect 3, but going by pictures, the lacing system on the PC4 has changed quite a bit. We’re also willing to bet (some of our readers can confirm this) that the lacing top down pressure is higher on the PC4. Why? Because the latest connect switches back to traditional eyelets instead of the closely space speed-loops of the Connect 3. This also spreads the PC4’s lacing wider, and resultantly increasing the pressure. Like many of adidas shoes, the lesser number of lacing rows (5+1) on Connect 4 just about manages to achieve a basic functional level, and not the reassuring snugness coming from the 6 plus one 2011 Pureconnect. The heel stack height isn’t anything to write about, but the ride’s surprisingly responsive and cushioned. Full service insole with generous padding and a very, very prominent arch curve. Landfill friendly foam. That’s what Biomogo foam is. Cushioning’s surprisingly responsive for this kind of silhouette. Look at the side profile, and you see that the heel stack height isn’t much. The foam thickness appears no higher than where the original PureConnect left it, but the density treads the border between soft and firm. 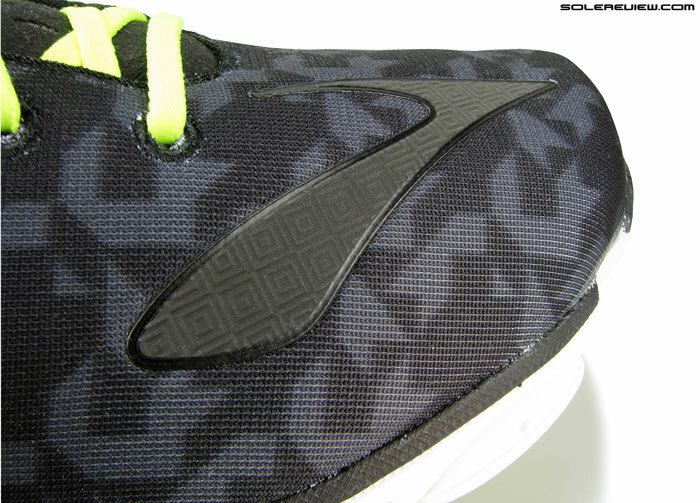 The midsole (DNA foam) works in tandem with the EVA strobel layer and cushioned Biomogo insole above it. The removable sockliner isn’t cut price; specs feel similar to what you might see inside a Glycerin or Ghost. 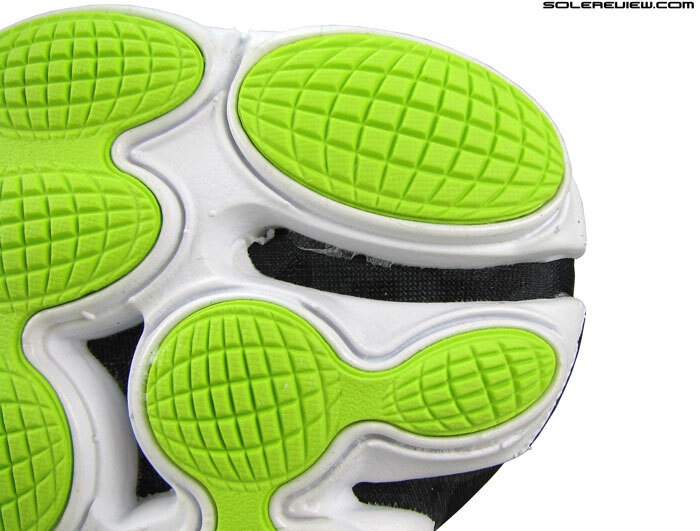 Outsole has a pod based layout; this architecture has its roots in Brooks’ popular outsole of old. You might remember shoes like the Brooks Radius SC (1996-97) and Tsunami, both of which featured the pod (or e2O) outsole. This geometry gives the PureConnect’s sole an immense degree of articulation. No less than 10 individual pieces of rubber (11 if you count the hard midfoot EVA pod) are stuck to its bottom, allowing a greater range of movement. Transitions come efficient on the Connect, which makes it a good for pace or simply serves as a lightweight (259 gms/ 9 oz) shoe with decent cushioning. 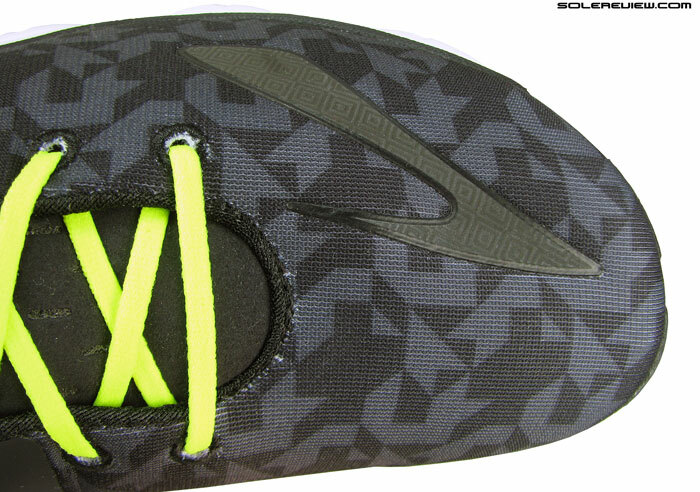 Outsole grip is tenacious. Each rubber pod has mini-lugs built in, and since they’re built of a soft compound, traction is good, very good. At least till the texture holds. Speaking of durability, we know not how long the Connect will last. Brooks says something on their website about the Pureseries being lightweight in build, and sets mileage expectations of 250-300 miles. We’d like to hear user experience on long term outsole wear, so look forward to your thoughts in the comments section. 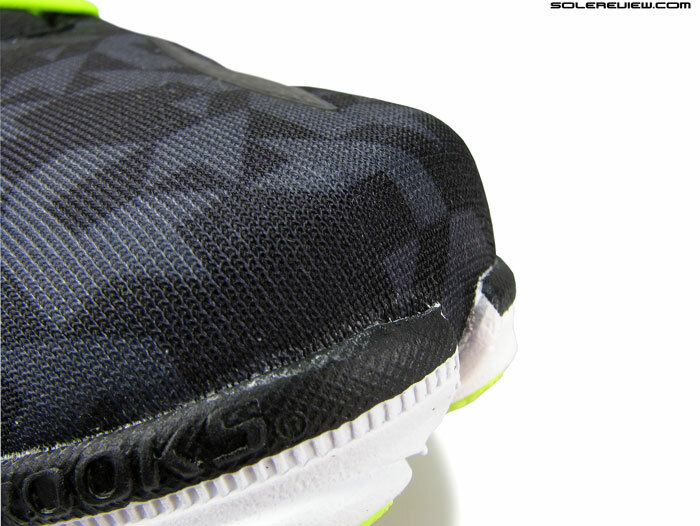 Right at the tip, the outsole seems to divide into two areas, a design feature which Brooks calls split toe. Product literature says that it enhances toe push offs and transition but the truth is much more mellow. The big toe does not have much of actual articulation, so it doesn’t allow big toe push-offs, at least not at the level you’d notice. The split toe is far from independent, so if you were expecting Nike Air Rift levels, then the PureConnect won’t pass muster. There is a positive outcome of this Biomimicry inspired design. Exposed areas in the forefoot make the PureConnect very flexible, which in turn makes the transition more natural. Less of a roll-off, but more work for your foot. No deal breaking negatives on the PureConnect to speak of – as a complete package, the shoe makes a good case for itself. 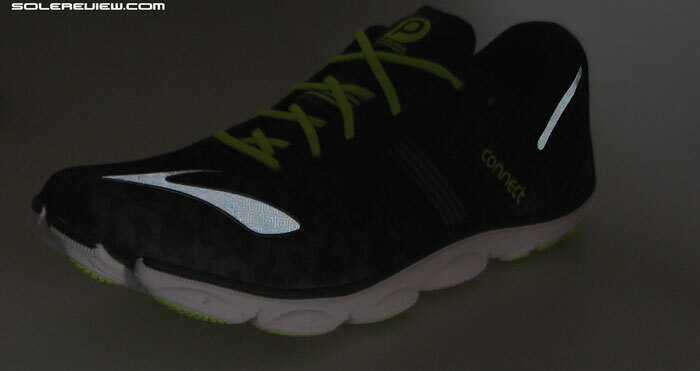 It is lightest in the Pure series, costs a reasonable $100, and it is well cushioned for a shoe which looks like that. The only catch is to know which Pure model to buy. Once we’re done review the PureFlow 4, we should be able to lay it out for you, soon enough. This is a great review. Thanks for all the work you do. I’m curious as to how this compares with the Kinvara 5? I usually run in the Pureflow, but I picked up pair of Kinvara 5’s to see if they would be a lighter, more responsive ride. The Kinvara 5 is just a touch too firm for my taste. Compared to the Pureconnect, the Kinvara 5 runs firmer – we’re on the same page, despite the thicker stack height. 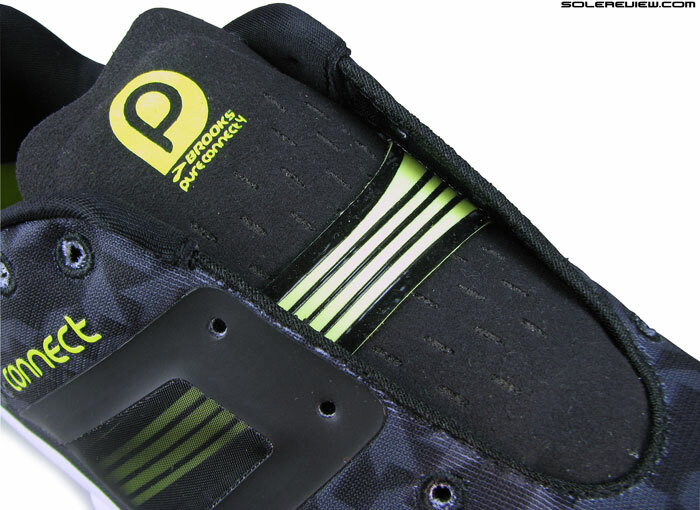 It also loses to PC4 on ground feel, traction and responsiveness, and the midfoot strap isn’t as evolved as the Pure’s. Personally, if we were in the market for a lightweight trainer, Brooks PC4 would be one of the strong contenders for our money. The pure connect one was my favourite shoe for years, I went through 7 pairs before I couldn’t find it anymore. I didn’t care for the PC2 so I am really optimistic after this review to try the PC4. My question is, how do you feel about the PC4 as a marathon race day shoe? I’ve worn the PC1 for two marathons and they were comfortable, it went well, but as I’m getting faster and looking for a BQ I want to give myself any advantage possible. I like the ~4mm drop of the PC compared to other shoes, and have a narrow foot with a fairly high arch. Any advice would be greatly appreciated! It would help if you are very specific about the things/areas you liked about the PC1 – we can offer areas of comparisons with the PC4 then. I really like the level of cushioning and how it’s placed, especially for a mid foot landing. I like the light weight, and generally snug mid foot as well. The 4mm drop is also appreciated. I like the flexibility for training but wonder if for racing a slightly less flexible sole is considered better? I’m curious about the Adidas boost line but they seem to put most of the cushioning under the heel, whereas I need it more midfoot, but maybe they would still be good? Or maybe the pure connect could be used a racing flat? I’m not sure. Thanks again. The new Pureconnect is slightly more cushioned than the PC-1, and it does well for early stage forefoot strikers too. Except that there’s a certain amount of give and take. Take for example, the PC4 forefoot is a little thicker, which robs the shoe of the focused ground feel and transition. It makes amends with the revised outsole design, which feels slightly less ‘lumpy’ than the PC 1 Pure connect 1 had a combination of flat rubber and oval lugs, which led to the sensation we just described. Not sure about the 4mm drop, Brooks has not published it on the PC4 page. Midfoot wise, the PC1 did a better job. It had more number or laces over a thinner tongue, delivering a sharper quality of wrap. Yes, we also prefer a stiffer forefoot for faster speeds, helps quick touch and go. 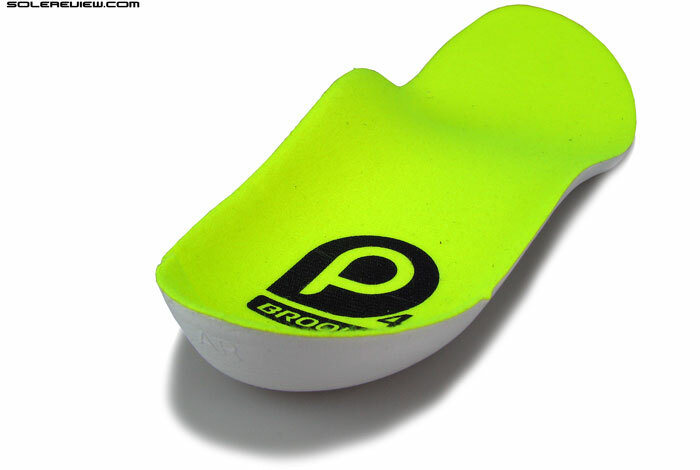 In that regard, the PC 4 is slightly less flexible and has a higher toe spring for easier toe-offs. All that said, we thought the original Pureconnect to be a superior shoe when it came to racing. The newer PC4 is a good shoe, but it just seems a bit diluted in focus in context of racing. You’re right, the adios Boost cushioning is skewed towards the heel, and the frontend’s fairly stiff. But the heel cushioning is far from mushy, and the stiffer forefoot’s great for pace. If you are using the shoe only for raceday, we wouldn’t worry about the lack of cushioning up front. Thank you so much for the detailed reply, I have a lot to consider now. This site is the best! Just an FYI: I emailed Brooks last week about the 4mm drop. They responded that all three shoes in the Pure lineup are indeed 4mm drop. I also asked why Runner’s World is reporting different measurements, and they claimed that they (Brooks) measure from the middle of the heel/forefoot where Runner’s World measures on the outside of the sole. Thanks for the additional info, that helps! What Brooks does is the correct way, but don’t think RW measures from the outside, the variances will be huge. I ran 20 km in the PC3. The ride was great, very versatile shoe. It can be used as a trainer, tempo shoe or even a racer (very flexible though). 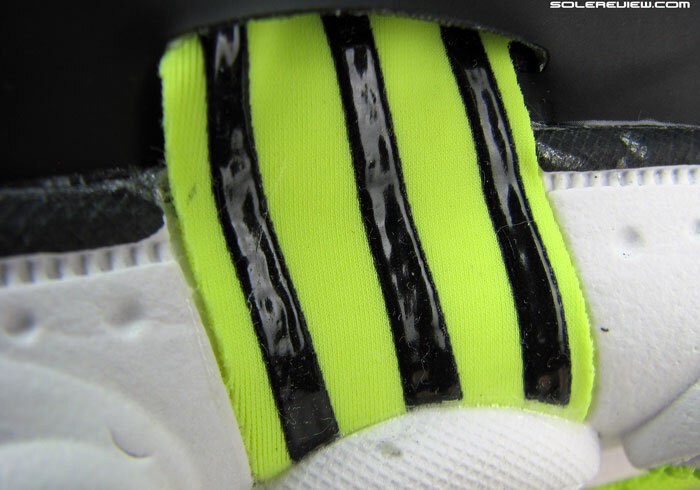 As far as I can see, the midsole remains unchanged in the PC4. Can’t speak of the Pureconnect 3, but the PC4 still has a shallow and cramped toe box. 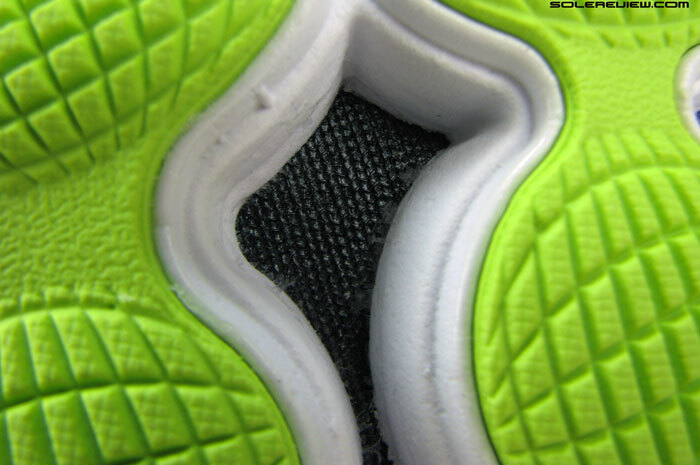 The midfoot is also tight, due to the wide medial Nav-band. The PureCadence 4 is firmer, but has a far roomier toe box. Our review up tomorrow. The original Cadence is still one of my favorite shoes ever but I ditched the 3s since the cushioning was too mushy. Then our opinion differs since we found the Cadence 4 to run firmer than Connect. And since the midsole on both hasn’t changed in a year, we’re essentially talking about the same shoes. I bought a pair last night and went running in them after wearing Nike shoes for years and it felt AMAZING. I had a foot injury for a little over a year, so running hasn’t been the easiest for me, but the Brooks Connect 4 made it painless and I felt like i was running on air. The toe box definitely has space to wiggle your toes, and its got the right cushioning in the all the right spots! Thank you for the feedback, Caroline! I was sold after running around the store a bit in this shoe. The low profile and “connection” to the ground felt great. I admit I did have my beefs with this shoe after a few runs, but you have to give it time. The mid-foot is tight, but it loosens up. After a 100 miles or so in this shoe it is like a second skin. There are shoes that just get worse, this one gets better with age. Also, I went up a 1/2 size, but I don’t think it was necessary. Ran my first Marathon in the original 2012 Pure Connects. In my opinion they were the perfect running shoe. No evolution required. Don’t know what it was about that first model but the models since haven’t had that same feel or “connect”. Going to give the 4 a good go, have a half marathon booked in for Jan 16. Thanks for the feedback. PC’s are a good place between racing flats and cushioned trainers, agree. But from what we hear, Brooks is completely redesigning their Pure line-up next year. I loved the 3’s after I cut the nav band out, bought the 4’s and within 2 weeks I developed an achilles insertional tendonitis. After doing some research it seems they changed the heel cup design. I am now in kinvara 5’s and having much less of an issue, I tried going back to the connect 4’s and within 2 runs the achilles was in bad shape. The Nike LunarTempo might be just the shoe. Thank you for the quick reply! 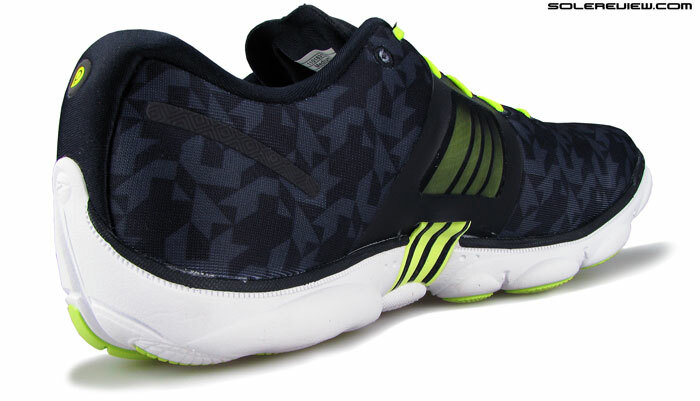 I am surprised that such a lightweight shoe could offer enough cushion to handle half/full marathons. I am a drop snob as well, but 8mm might give my achilles a bit of a rest too. The LT has plenty of go for long miles, though it depends on what your definition of ‘cushion’ is! But if you need the last word on lighweight cushioning, then the Hoka Clifton 1 is the shoe to buy. Not sure about the 1400 v3. Have heard great things about the V2, though. The Hoka Clifton, imo, is a bit much on the cushion side of things. It was why I really liked the Brooks as they seemed to strike a happy medium. Thanks again for your help. Then give the NB 1500 V1 a try too. A little more cushioned than the PC, and the medial post thingy is not noticeable. Brought it up since you mentioned the 1400. Does anyone know when the new model of Pureconnect should come out? I’m having problems finding my size (women’s 8) in the color scheme I want.